Description: This beautiful bungalow is located in quiet and peaceful village, which is situated only 15 min drive from the wide sandy beaches of Kavarna town and the golf courses area. The village has its own pubs and shops, a restaurant, a post office, a town hall and regular transportation to the surrounding towns and villages. The closest big town is Kavarna, which provides amenities like state administration, hospitals, wide sandy beaches, banks, delicious meal restaurants, night clubs and etc. Three world class championship golf courses are situated on approx 15-20 min drive. The glamorous seaside town of Balchik, popular with the picturesque marina port, the old historical castle, the huge botanical garden, the busy summer life, is 25 km away. The house is one storeyed and comprises living room, dining room with stone fireplace, 3 bedrooms, bathroom with WC. The house has been recently refurbished with handy stone and wooden elements and is move-in ready once furnished to your personal taste. Features: thermal insulation, gypsum plasterboard s, PVC window frames, new wooden ceilings, parquet flooring s in the bedrooms, ceramic tiles in the rest of the premises, fully equipped bathrooms with bath-tub. This lovely bungalow is located in the central part of the village, which ensures the easiest access to the amenities in it and enjoys spectacular natural views. The property provides beautiful and spacious 1450 sqm garden, which is walled and fenced enclosed with a stone wall and wooden gate. There is a well in the garden. The Yard offers enough space for building of additional amenities such as a swimming pool, a barbeque, etc. 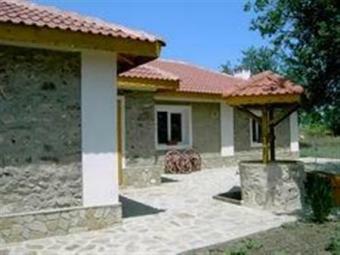 It`s location and the village popularity, makes the selling price extremely good. The property would be ideal for any looking at permanent relocation, a holiday home or as an investment. THIS COULD BE YOUR HOME!